GREAT PUNCHES for all kinds of jobs and comes with a handy carry pouch. FAST AND SAFE: Help to drive out or insert solid pins, hollow pins, and springs. USED FOR removing pins, simply take the heat treated puncher and hit with a hammer to remove the pins from the Machinery, Jewelry or whatever else you are working on. 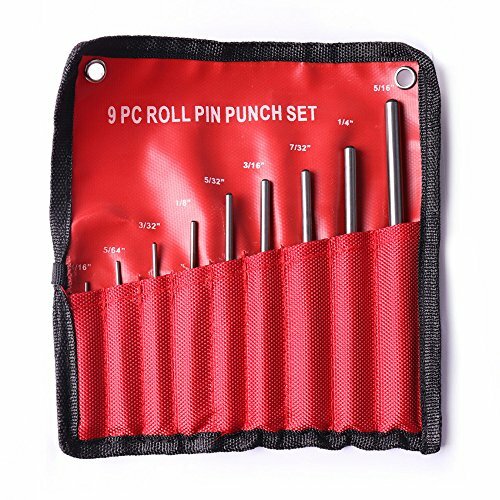 Grip Roll Pinch Punch Set (9 Pieces): This premium quality hardened steel 9 piece punch set is designed to easily remove roll pins from firearms. Balled tip helps locate the punch on the pin and protects pin ends from damage during removal or installation. Help to drive out or insert solid pins, hollow pins, and springs. This premium quality hardened steel 9 piece punch set is designed to easily remove roll pins from firearms.